8.2 km (5.1 miles) WNW of Liptovská Teplička, Prešovský, Slovak Rep.
11-May-2015 -- This is the last out of 4 reports reaching confluence points during a bicycle trip through Austria, Czech Republic, and Slovakia. The story starts from 49°N 17°E and continues from 49°N 19°E. Time was running out a bit. Cycling from Belá-Dulice near 49°N 19°E all the way to this confluence point was too tight in consideration that I had to travel back to Vienna the same day. So I cycled to the nearby town Vrutky and took a train to Štrba. Štrba is a beautiful little town situated at the southern edge of the High Tatra Mountains. From the train station, this confluence is located 12 km beeline to the south-west in the Low Tatras (Nízke Tatry). On little country roads, I rode up to a distance of 1.5 km. I left asphalt and continued cycling on a gravel track through the forest up to 500 m. When I reached a meadow with two houses, I abandoned my bicycle and started hiking upwards in beeline direction to the confluence. The hike was very steep, but not dangerously steep. After gaining around 200 m altitude, I reached the confluence right at the edge of the forest with a great view overlooking the meadow and the nearby hills. This is surely one of the most beautiful confluence points I have visited. 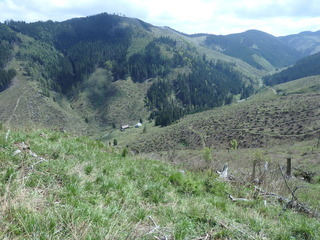 But I have to admit that the beauty is based on two facts: Firstly, the weather was great at the time of the visit and secondly the great view is due to a heavy windstorm in November 2004 that had deforested the area. Right after the visit, I had enough time to catch my train in Štrba that would bring me to Vienna and Zurich. So I dawdled on my way, taking pictures here and there. After a while I found it strange that the place overlooking Štrba was not coming up. But I continued happy-go-luckily. Finally, I looked at my mobile map, finding out that I had taken the wrong valley. This valley had a similar road and a similar river parallel to it with the same type of forest around. I had not noticed that this was not the road I had come from. Now, time was scarce. It was 30 km to cycle with one hour of time left. But considering the steep hills, this was not possible for me anymore! This meant not catching my last train to Vienna and not being at work in Zurich on Monday! Nevertheless I cycled as fast as I could like crazy. Back in Štrba, I had still 3 km to reach the train station, but only 8 minutes left – not enough time to ride 3 km uphill and catch the train. But accidentally, there was a taxi in town, just finishing up a delivery. The taxi was big enough to load my bicycle without taking it apart. Just 1 minute later we were heading off and reached the train station in time! I ran to the platform – only to find out that the train had a 20 minute delay. However, I was happy to have managed both: a successful visit and a successful return trip home.